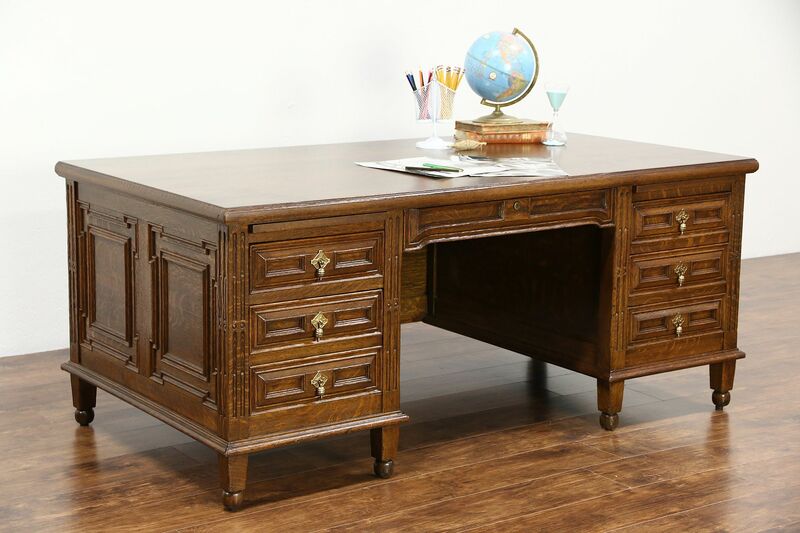 An executive desk from the 1930's was crafted of quarter sawn oak in the English Tudor manner. Deep drawers have dovetailed joints, some have adjustable dividers. Detailed moldings and paneling are authentic on this American made unsigned vintage office or library furniture. Brass hardware is original, there is no key for the center drawer. Two pull out shelves afford extra work space. Size is 73" wide, 39" deep and 30 1/2" tall, the knee hole is 29" wide and 24" tall.